The morning after making history as the first black man to win a Golden Globe Award for lead actor in a TV drama, Sterling K. Brown fulfilled an acceptance speech promise: He took his 6-year-old son Andrew to school. 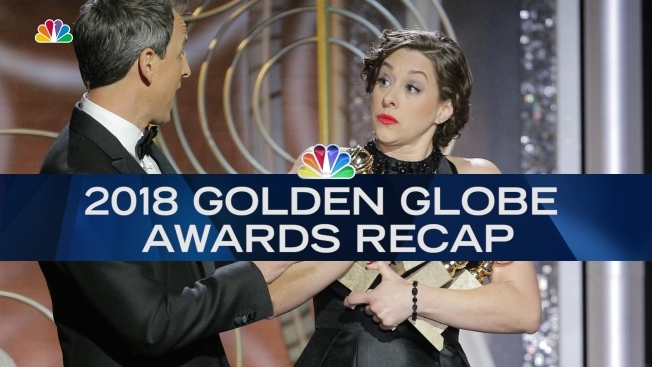 Brown said he was "humbled" by the Golden Globe win for his role on NBC's "This is Us" and will "cherish it" all his life. Family time is important to Brown, who also has a 2-year-old son Amare with his actress-wife Ryan Michelle Bathe. "I did not have children so I could see them every three months," he said in a recent interview with The Associated Press. He said their connection serves him as an actor. "Young people infuse you with so much vivacity. There is so much to learn. Every acting school teaches you to get back in touch with the child inside of you. Once I became a parent it became easier to a certain extent because I was surrounded by it all the time," he said. Brown, 41, plays devoted family man Randall Pearson who was adopted by white parents as a baby on "This is Us," which returns Tuesday with a new episode. "I love his intellect, his heart and all of his corniness," said Brown, who won an Emmy last year for his portrayal of Pearson. Brown will guest star on Fox's "Brooklyn Nine-Nine," where he will appear with Andre Braugher, the black actor who won a leading-actor Emmy Award almost 20 years ago. "It exceeded expectations," Brown said of shooting scenes for the show. He also has a role in "Black Panther," the Marvel movie about the first black superhero, scheduled to open Feb. 16. "The level of production of a film with a predominantly African- American cast, it hasn't happened. It literally hasn't happened. There would be times I would be at base camp and you would see 24 trailers lined up one after the next, and you would see black faces coming out of those trailers one by one to go shoot something and there's pride," he said. "I would get misty." Viewing parties are being scheduled around the country for "Black Panther," but the most important one for Brown is the screening that he'll have with son, Andrew. "I'm a cinephile. I love going to the flicks. I remember going to see 'Superman' and 'Batman.' Now I get to take my son to go see 'Black Panther,' and Chad (Boseman) as Black Panther will be as normal for him as Christopher Reeve as Superman was for me," he said. "That means something. There's a normalization that occurs so you're not so starved to see images of yourself onscreen." Brown says his method for choosing roles is to find projects that help him grow. He's trying to vary studio opportunities with stories that are more independent and character-driven. And he enjoys the challenge of adapting to different sets. "The set of 'Black Panther' is different than the set of (his movie) 'Marshall,' and you have something to learn from both, but they're two different skill sets. On 'Black Panther' you shoot maybe a page or two a day. ... I'm on television and we'll shoot eight pages in a day. It is a skill that needs to be exercised."